While you are out for business or job or for vacation, it is easy for thieves to spot your property for a quick loot. Luckily, security solutions designed to help you monitor your property when you are away, provide some relief. These systems are meant to notify you quickly whenever something unusual happens. Most of these security systems are advanced versions of traditional items like garage doors, deadbolted lock and doorbell. 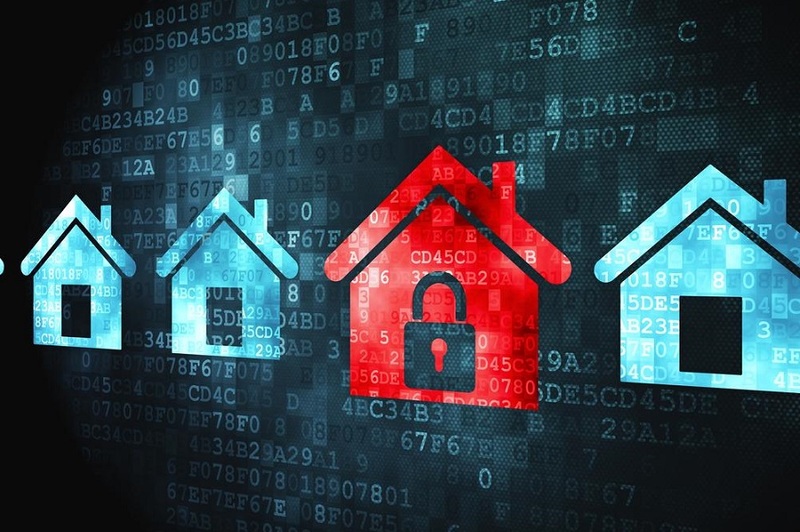 With the evolution of technology, the modern market is flooded with different types of high-tech solutions intended to keep your loved ones and your possessions safe. Here are the top 10 security solutions which promise you a ‘zero crime’ future. The Netatmo Welcome security system is specially designed to serve both security and privacy concerns by knowing you and your family and keeping a watch on visitors while you are away. A powerful camera with integrated facial recognition, this system works by keeping track of who it sees and the user can customize the alerts. Features – The camera is designed to constantly film and record upon seeing a face or detecting motion. It offers a 130-degree field of view and even night vision. The design of the system is quite elegant. The gold colored tall cylinder is accented with white on the top and bottom. A black colored strip runs through the middle. The device looks pleasant and inoffensive and doesn’t resemble a camera. On the back of the device is a slot for micro SD card. Setting up Netatmo on the Wi-Fi is a painless and quick process. Simply plug it into the wall socket to start using the system through the app on your smartphone. Alternatively, you can plug it onto the computer and use the system’s web interface on any browser. Pros – Easy setup. Customizable notifications. Cons – Low-speed facial recognition. Slow live feed and notifications. Two-way audio and audio alerts not available. An innovative idea from Sony, the Sony SmartEye is designed to bring augmented reality to practice. This device can attach to any eyeglasses and help improve the activity. It is intended for sport and running is the main purpose of this device usage. The design concept is quite simple and resembles that of Google Glass. In this system, supplementary clips onto glasses’ side to infuse a camera and a tiny OLED screen. This system is developed to help runners with GPS navigation in their runs through unknown cities so that they can find routes without having to stop and use their phones whenever they find a strange street. Features – The tiny screen is just 0.5cm meaning that it does not disrupt the vision. The smart eyeglass frame is waterproof and allows using it while sweating without any worry. The device enables adjusting the fit according to user preference. It can easily connect with GPS and make all the necessary information always accessible to the user. It offers a reliable way to plan one’s run. Any direction of head tilt still gets the information in front of your eyes. Pros – Attachable to sunglasses or eyeglasses. Gets GPS watch in front of eyes. Includes a camera. Cons – The big element that holds components and battery. Little cumbersome to get the right fit. 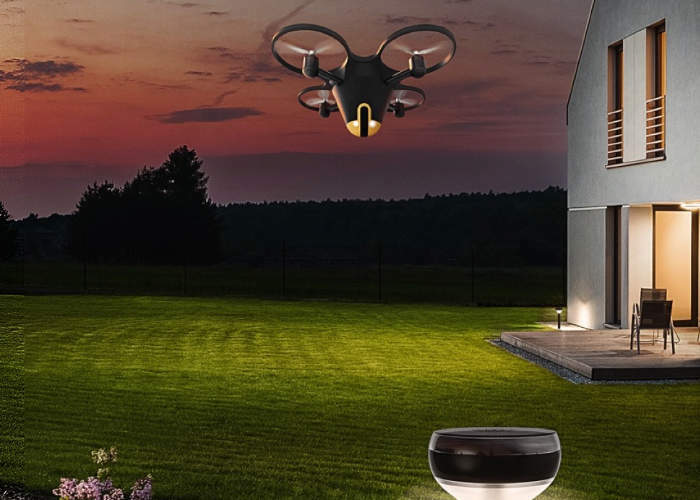 A complete property security system, Sunflower Drone Security System makes use of cameras and lights to detect activity. The design concept of this system is based on the small solar lights distributed across the entire building. These lights are much more powerful than simple sun-powered path markers. They are equipped with sensors and able to detect motion in your area. The drone can be deployed to work on the point of activity. Features – Every solar light is equipped with many sensors meant to detect sound, vibration, and motion. Whenever any disturbance is sensed, a light notifies the user through an app on his tablet or mobile phone. The perfect location of the activity is also sent and the user can choose to dismiss the notification or command the drone for further action. The drone is featured with infrared light that allows night vision. This means, your flying camera, using solar lights as marking points for navigation, lets you have a closer look without the need to get your head out of the window. It transmits a live video feed to your tablet or phone. The drone seems to fly above and gets you a bird’s eye view of the building. One of the most powerful door and window sensor systems, the Ecolink Z-wave Sensor is designed to continually monitor the status of your windows, doors and other open/close items. 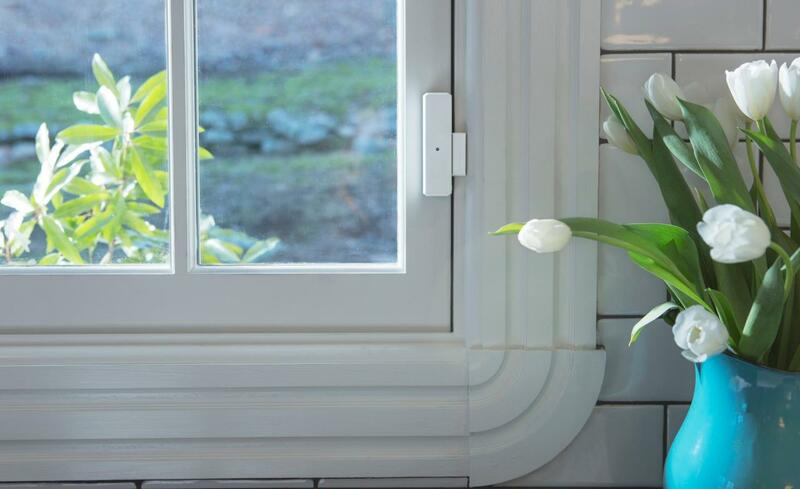 This device is made up of two parts – the magnet which is mounted on the window or door and the sensor which is mounted on the door or window frame. Upon separation of the two parts, the system triggers an alert. You can customize the notification as to whether you want to activate a video camera, an alarm or lighting. Both these parts can be installed easily using the components included. Features – EcoLinks Z-Wave Door & Window Sensor is designed to integrate into any existing home and office security systems and works with most Z-wave controllers including Piper, Nexia, Homeseer, VeraLite, VeraEdge, Zipato, and others. It monitors the door or window continuously to provide the close/opens status of the object. It reports when it is tampered with using tamper sensing design. Installation is quick and easy. It features a battery life of about 3 years. It comes with two interchangeable covers in brown and white colors. WallyHome is a highly efficient water leakage detection system that uses innovative networking technology. Water leaks can be potentially harmful to any building. This system is designed to report water leaks quickly. It makes use of a technology which converts the electrical wiring of your house into an antenna and allows placing wireless sensors near any suspicious trouble point. The core of this system is the SNUPI Technology that creates an ad-hoc network out of the house’s wiring. As soon as you install and start the device, it converts every wire in the house into an antenna through RF signal emission through them. A sensor positioned near the wire on the circuit of the hub can communicate with the hub wirelessly. You can use the app on your phone or web interface to receive notifications regarding any leaks detected. It also monitors humidity and temperature and gives reports. Features – The hub of WallyHome system is an all-white router-sized device circular in shape with one flat area. Its design resembles a large D and the overall look is clean and modern. Two lights on its top show up Internet connectivity and power. Ports for Ethernet and power cables are on the flat side. The sensors look like small sized hubs. One side of the sensor is a large button surround by LEDs. There are two metal contacts on the flat side and three on the opposing side of the button. Whenever moisture is detected on any of the metal contacts, an alert is sent to the hub. The sensors are designed to be slim so that they can be positioned in tight areas like pipes and under appliances. Pros – Highly sensitive sensors. Easy to set up. Instant alerts for leaks. Cons – Unable to connect to other smartphone hubs. For those who are looking to add a security solution to one’s garage door, Chamberlain MyQ Smart Garage Door Controller is a great choice. This system allows opening and closing garage door from any place using internet connection. It lets you set the custom alerts and also monitors the open or closed status of the garage door. Many robberies and forced entries happen due to the vulnerability of garage doors, ensuring that the garage doors are well serviced and properly secured can surely help bring this number down. Features – Installation of MyQ Smart Garage is extremely simple. It has a wide compatibility and hence, it works perfectly with your current hardware in the garage. It is also possible to coordinate the system to interact with any number of connected home platforms. It is a low-cost solution that delivers all its promises. The MyQ Garage kit consists of two hardware components – a base station which adheres to the garage ceiling near the existing opener and a sensor which attaches to the garage door. Setting up the system is extremely easy. Once you connect the unit with your devices, you get access to your garage door opener from any place you have an internet connection. A smartphone app allows getting significant insight and control over the activity of garage door. Pros – Affordable solution. Easy to install. Ability to set custom alerts. Cons – No support for popular automation hubs. A powerful home security monitoring system, LiveWatch Smart Alarms & Monitoring Service comes with fast processing of emergency alerts. They use wireless equipment and also make use of broadband or cellular connections to send out emergency alerts. The LiveWatch Plug and Protect Basic home security kit consists of a pushbutton control panel. It includes an indoor motion detector and two entryway sensors. This equipment can be connected to a keyfob remote or a mobile app for better control. Another system is the advanced Livewatch security set that uses a built-in camera and a 7” touchscreen control panel. Easy to use apps on the panel let you access weather, security, and other features. LiveWatch offers budget-friendly wireless security solutions for homeowners and renters. ‘As Soon As Possible Emergency Response’ lets the operator’s process alerts quickly. Whenever an alarm system is triggered, a text message alert is sent immediately to the owner and others in the alert list. LiveWatch security systems are easy to set up and can be installed without any technical assistance. LiveWatch offers a wide variety of automated door locks, motion-triggered Z-wave security cameras, and location-based control which works with a smartphone to secure the home. Pros – Affordable Price. Easy installation. Home automation. Fast alerts processing. Environmental disaster protection. An excellent, well-designed security camera for optimum security, Nest IQ Indoor Wifi Security Camera comes with integrated facial recognition technology. The latest security camera from Nest is the first ever to incorporate face recognition. It can not only record video footage and detect motion but also alert the user about the person who has entered the building and whether he is familiar or not. Features – Nest IQ camera is designed to integrate with various existing products for lighting and voice control. For example, this camera can be programmed to switch few or all lights on the property ‘On’ if a movement is detected. The IQ is housed in a two-part box just like an iPhone. It is made out of white polycarbonate and appears to be well-built. It comes with a stand for positioning on a flat surface. Setting up and operating the camera is straightforward and simple. It is possible to monitor the room in real time using a smartphone. It offers a 130-degree view of the area in HD resolution. The 12x zoom facility allows looking closer. Nightvision mode allows monitoring in darkness too. Pros – Well-built. Records HD footage. Attractive design. Two-way audio. Cons – Expensive. Gets hot. Offers limited functionality in the basic version. One of the best security systems of the time, Danalock V2 Smart Locking offers best-in-class convenience and control. An excellent option for renters and homeowners, Danalock is a convenient smart lock protects the user property against crimes. It offers a security that depends upon the strength of your deadbolts. Its software uses powerful encryption technology for protection against electronic attacks and hackers. It sends out mobile and audio alerts when not able to lock, in case the door doesn’t close completely. The mobile app allows adjusting the settings, viewing lock activity and adding users. Two convenient features of the lock are twist assist and auto-unlock. Twist assist helps to lock manually while auto-unlock feature uses the location of the phone to unlock the unit automatically when you are close to home. Features – It is possible to connect Danalock to smartphone platforms like Logitech harmony, Nest, and Z-Wave. Though Danalock does not connect to your video doorbells, it allows controlling both from a single app if you use a compatible smart home system. Pros – Use of Z-Wave and Bluetooth. Fully functional mobile app. Easy installation. Much more than a surveillance camera, the Piper makes use of sound and motion detection to notice and inform you about any activity. It also keeps track of indoor and outdoor humidity and temperature and provides weather alerts. Moreover, this device works with and controls different Z-wave automation devices like dimmers, smart switches, range extenders and window and door sensors. Features – The latest version of Piper uses a 3.4 mp sensor with full HD resolution. The camera front has a fish-eye lens, a microphone, and a motion sensor to facilitate two-way communication. On the top of the camera is situated a loud 105dB siren whereas the back features battery compartment and power jack. It is powered by a Z-wave controller, a networking circuitry, sensors for light, humidity, temperature and sound and an ARM processor. The camera comes with tilt and pan functions to offer a 180-degree view and the powerful 10x zoom allows getting close-up views. This new version of Piper comes with a ring of infrared LEDs around the lens. The camera is supported by a silver color stand and also includes a snap-on mounting panel to let you hang on the wall. It is available in white and black finish options. Pros – Sharp night vision. Outstanding HD image detail. Two-way audio. Tilt, pan, zoom functions. Integration with Z-wave devices. Cons – Local storage and web app not available.